What is a residency and how do you apply for it? Any stay in French territory for more then three months is considered as residency. To become a French resident you need a residency permit, with the exception of EU/EEA nationals for whom the residency permit is no longer mandatory. However, even for EU-citizens a residence permit (carte de séjour)is very useful, as this makes life easier,and without one you cannot get access to many state services or aids - such as housing financial aid, etc. Since 2009, long stay visa holders are allowed to stay in the country for up to 12 months, according to the purpose of their stay and the validity of their visa. However, if they intend to stay for more than six months, they need to register at the French Office of Immigration and Integration during the first three months of their stay. Non-EU/EEA nationals. Unlike visas, residence permits are only issued in France. You apply in person at your local préfecture de Police or sous-préfecture in at the services des étrangers (foreigners office). If the prefecture is not close to your place of residence, you can also apply through your local town hall office (mairie). To make an application, you need to have obtained a long-stay visa before coming to France. 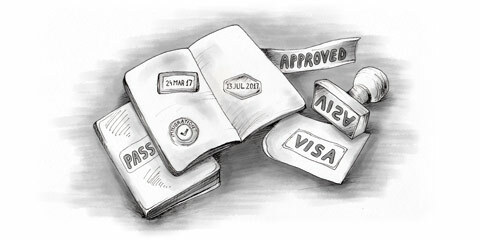 A short-term visa is not sufficient to make an application for residency! Original and photocopy of your passport with a valid long-stay visa. Birth certificate (acte de naissance, état civil), in addition to certified translation into French, which should be produced in your home country (or at your country's embassy in France, who may be able to provide this service) by an official translator accredited by the French Embassy in your home country. Original and photocopy of proof of residence (statement of domicile, electricity bill or rent receipt, Justificatif de domicile). Proof of income: Employees must present a certificate of employment and latest payment slips. Self-employed people must provide proof of their status (subscription to URSSAF, trade or TVA register, etc.). Retired and unemployed people must provide proof they have adequate financial resources to live in France. If a document is not in French, you should supply a certified French translation. On submitting all documents, you will receive a receipt acknowledging an application for a residence permit. This acts as the document legalizing your temporary stay in France until you get your permit (or not). The whole process takes from between a week to a few months. A residence permit usually also gives the right to residency for your spouse and children (when minors).